I have received the news tonight from Zahraa Adel Awad in Alexandria that the Villa Ambron where Lawrence Durrell lived from 1943 to 1945 was torn down yesterday, 19 September 2017. In the octagonal tower of the villa Durrell wrote Prospero's Cell about Corfu and the first pages of what was to become Justine, which grew into The Alexandria Quartet. Zahraa is a wonderful tour guide in Alexandria who takes a special interest in the city's cosmopolitan and literary past. Both photographs in this post were taken by her. Thank you, Zahraa. 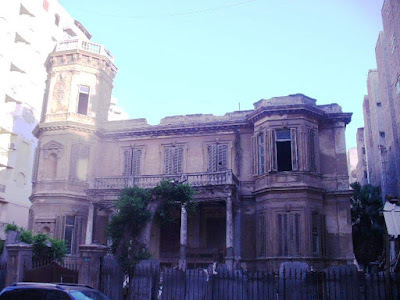 For more on the Villa Ambron and the long campaign to save it and to turn it into a museum of Alexandria's cosmopolitan past, see here.